After a large orthopedic intervention, such as total hip replacement or limb saving surgery, it is often more difficult for patients to perform activities of daily living than before the operation. In this doctoral thesis, we investigated which level of functioning is typically achieved after these interventions, using 3D movement analyses, strength measurements, and questionnaires. With these data, we formulated recommendations for the rehabilitation and the surgical treatment. Besides patients, we also performed movement analyses on healthy subjects, with the aim of better understanding how the leg muscles contract during walking. To this end, we injected the subjects with a harmless dose of radioactive sugar. The muscles then used the sugar as fuel while contracting. Using a PET scan, we were able to visualize each muscle’s activity during the walking motion. This lead to a metabolic map of the leg muscles, and this map is very valuable in our understanding of human movement. 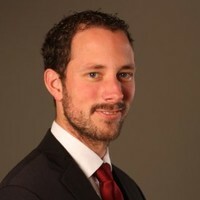 Sjoerd Kolk studied Biomedical Engineering at the University of Twente and obtained his Master’s degree in 2010. He carried out the above doctoral research at the Department of Rehabilitation of the Radboudumc, within the Radboud Institute for Health Sciences. Currently, he works as a Business Developer for orthopedic applications at the company Materialise in Belgium.